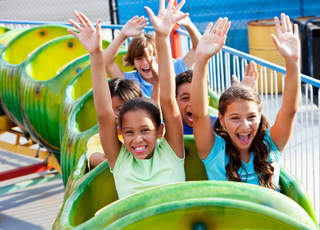 With the continuous improvement of people’s quality of life, there are more and more children amusement park. In the operating process of the children amusement park, what useful experience that operators can learn from? First of all, the children playground equipment can be divided into various types, such as rotating rides, bumper cars, inflatable castle, track and trackless train rides and so on. Different products will bring different economic value in the late. Thus, Zhengzhou Jinshan Amusement Equipment Machinery Co.,Ltd. remind that operators should purchase some novel, beautiful appearance, cost-effective products according to their business plan and crowd positioning, which pave the way for the late operating process. Secondly, the income of the children amusement park that located in places that with large crowd will certainly better that those remote places. So in the case of sufficient fund, operators should make a lot of observation of the local area in advance, then select a crowed place to start their business of children amusement park. What’s more, most of the children playground equipments are interactive products, so there usually are many tourists during the operation time. In order to ensure the safety of personnel and equipments, operators should do a good job in surrounding environment inspection work and remove the obstacles as soon as possible. And operators should occasionally maintain the equipments components to reduce the failure rate. Development trend of different kinds of children amusement equipments. Some suggestions on running a children amusement park. The above is a brief introduction to the relevant content. Zhengzhou Jinshan Amusement Equipment Machinery Co.,Ltd. as a professional children playground equipment manufacture, welcome to pay attention to our website and get free quotation. Next： What Are The Tips For Choosing A Good Quality Children Amusement Equipment?